While scientists have been able to prove the existence of small and super-massive black holes, the existence of intermediate-mass black holes was elusive, until now. New research coming out of the Space Science Center at the University of New Hampshire shows the strongest evidence to date that this intermediate-mass black hole exists, when one was captured, in action, devouring an encountering star. The research was supported by the Chandra X-ray Observatory Center through the National Aeronautics and Space Administration, as well as NASA grants distributed to UNH. Researchers used data from a trio of orbiting X-ray telescopes, NASA’s Chandra X-ray Observatory and Swift Satellite as well as ESA’s XMM-Newton, to find the multiwavelength radiation flares that helped identify the otherwise uncommon intermediate-mass black holes. The characteristic of a long flare offers evidence of a star being torn apart and is known as a tidal disruption event. Tidal forces, due to the intense gravity from the black hole, can destroy an object – such as a star – that wanders too close. During a tidal disruption event, some of the stellar debris is flung outward at high speeds, while the rest falls toward the black hole. As it travels inward, and is ingested by the black hole, the material heats up to millions of degrees and generates a distinct X-ray flare. 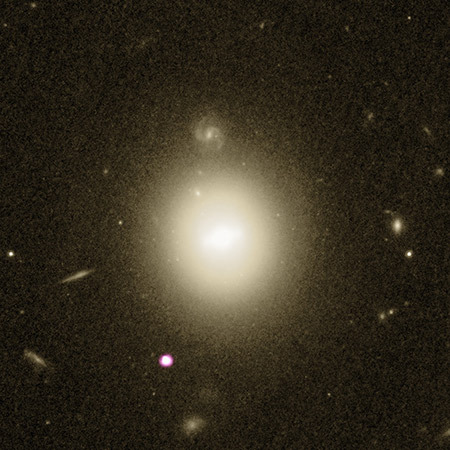 According to the researchers, these types of flares, can easily reach the maximum luminosity and are one of the most effective way to detect intermediate-mass black holes. Because of the very low occurrence rate of such star-triggered outbursts for an intermediate-mass black hole, the scientists believe that their discovery implies that there could be many intermediate-mass black holes lurking in a dormant state in galaxy peripheries across the local universe.